We've included these beaches for you: Marathi beach and Balos Lagoon. 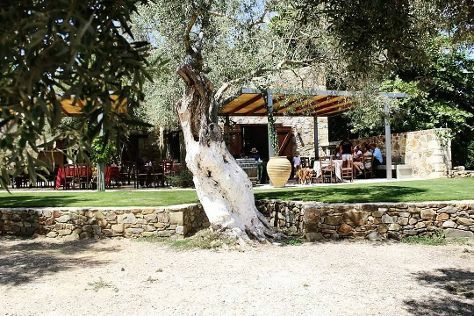 Get some cultural insight at Manousakis Winery and Kastro Gramvoussas. Explore the numerous day-trip ideas around Chania Town: Apostolakis Handmade Ceramics (in Maleme), Winery Dourakis (in Alikampos) and Holy Trinity Monastery (Agia Triada) (in Akrotiri). There's more to do: stroll the grounds of Souda Bay War Cemetery and see the interesting displays at Greek National Football Museum. To see other places to visit, reviews, traveler tips, and more tourist information, read Chania Town trip planner . Sao Paulo, Brazil to Chania Town is an approximately 21.5-hour combination of flight and shuttle. You can also do a combination of bus, flight, and shuttle. Due to the time zone difference, you'll lose 5 hours traveling from Sao Paulo to Chania Town. Expect somewhat warmer temperatures when traveling from Sao Paulo in June; daily highs in Chania Town reach 34°C and lows reach 22°C. Finish your sightseeing early on the 4th (Thu) to allow enough time to travel to Rhodes Town. Kick off your visit on the 5th (Fri): kick back and relax at Faliraki Beach. Keep things going the next day: contemplate the long history of Ancient Kamiros, admire the landmark architecture of Agios Nikolaos Fountoukli, then tour the pleasant surroundings at Stegna Beach, and finally don't miss a visit to Monastery Tsambika. To find other places to visit, where to stay, photos, and other tourist information, you can read our Rhodes Town travel itinerary planner. Do a combination of shuttle and flight from Chania Town to Rhodes Town in 4.5 hours. Alternatively, you can do a combination of car and ferry; or do a combination of shuttle and ferry. In June, plan for daily highs up to 32°C, and evening lows to 25°C. Finish up your sightseeing early on the 7th (Sun) so you can travel to Vienna. Discover out-of-the-way places like Central Cemetery (Zentralfriedhof) and Gloriette. Your cultural itinerary includes sights like Kunsthistorisches Museum Wien and Historic Center of Vienna. The adventure continues: steep yourself in history at Belvedere Palace, admire the natural beauty at Schonbrunn Palace, see the interesting displays at Imperial Palace (Hofburg), and indulge your senses at some of the top wineries in the area. For traveler tips, reviews, photos, and more tourist information, refer to the Vienna road trip planner . Getting from Rhodes Town to Vienna by flight takes about 6 hours. Other options: do a combination of flight and train; or do a combination of ferry and car. You'll gain 1 hour traveling from Rhodes Town to Vienna due to the time zone difference. Expect little chillier temperatures when traveling from Rhodes Town in June; daily highs in Vienna reach 29°C and lows reach 15°C. Finish up your sightseeing early on the 10th (Wed) so you can travel to Geneva. On the 10th (Wed), see the interesting displays at Musee Ariana, kick back and relax at Bains des Paquis, then ponder the design of The Geneva Water Fountain, and finally wander the streets of Vieux-Carouge. For ratings, more things to do, traveler tips, and more tourist information, go to the Geneva trip planner . Fly from Vienna to Geneva in 4.5 hours. Alternatively, you can do a combination of flight and train; or drive. In June in Geneva, expect temperatures between 28°C during the day and 15°C at night. Wrap up your sightseeing on the 11th (Thu) early enough to take a train to Montreux. On the 11th (Thu), take in the spiritual surroundings of Cathedrale St-Nicolas, take in the spiritual surroundings of Cathedrale de Lausanne, then identify plant and animal life at Corniche Lavaux Vineyards, and finally admire the landmark architecture of Chateau de Chillon. Get ready for a full day of sightseeing on the 12th (Fri): explore the engaging exhibits at Chaplin's World, then take in the spiritual surroundings of Abbaye de Saint-Maurice d'Agaune, then step into the grandiose world of Chateau de Tourbillon, and finally step into the grandiose world of Church-Fortress of Valere. To find reviews, ratings, maps, and other tourist information, go to the Montreux attractions site . Traveling by train from Geneva to Montreux takes an hour. Alternatively, you can drive. Finish your sightseeing early on the 13th (Sat) to allow enough time to drive to Interlaken. 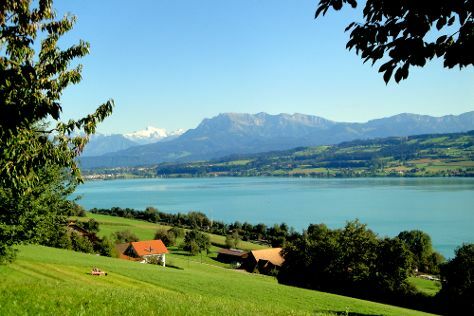 On the 13th (Sat), take an in-depth tour of Swiss National Museum and then kick back and relax at Seebad Eich. Get ready for a full day of sightseeing on the next day: stroll through Strandbad Tiefenbrunnen and then wander the streets of Old Town (Altstadt). For where to stay, other places to visit, more things to do, and more tourist information, read Zurich trip planner . Traveling by car from Montreux to Zurich takes 2.5 hours. Alternatively, you can take a train; or do a combination of train and flight. In June, daytime highs in Zurich are 27°C, while nighttime lows are 15°C. Wrap up your sightseeing by early afternoon on the 15th (Mon) to allow enough time to travel back home.